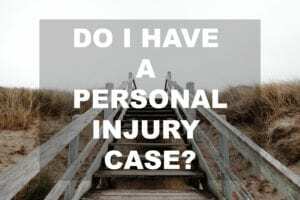 What is a Personal Injury Claim and Do I Have a Case? Home » News » Do I Have a Personal Injury Case? Knowing what is a personal injury claim is an important first step before filing a personal injury lawsuit. Personal injury law covers a substantial number of accidents that encompass many scenarios. By definition, a personal injury claim is a claim for liability and damage done to you as a result of the negligence of another party and the basis for a personal injury case. Suffering a personal injury is a trying experience and knowing if you have a case or should move forward with a claim can be overwhelming. Speaking with a personal injury lawyer can help you decide whether or not you have a viable personal injury case. Personal injury cases are decided on the basis of liability and damages. Your personal injury claim must prove that the defendant is liable for the damages you suffered along with the nature and extent of those damages. The personal injury claim rests on you proving liability and damages in order to receive compensation for your loss. Though negligence of some kind is the source of personal injury cases, most typically it happens as a result of an accident. Therefore, determining who is at fault will be the basis for your personal injury claim. For example, statistically, most personal injury claims arise from car accidents. The injuries you sustained are due to the fault of the driver of the other car. The accident happened because the other driver did not exercise reasonable care in driving. Maine drivers should know that the law provides specific remedies for those who have sustained injuries as a result of an automobile accident and awards can be significant. Besides Car Accidents, What is a Personal Injury Claim? Of course, filing a personal injury claim for negligence goes far beyond car accidents. The basis for liability and damages personal injury lawsuits vary considerably. They include such things as medical malpractice, workplace accidents as a result of on-the-job construction site negligence. Personal injury can also be caused by landlord or property management negligence. Know as premise liability, it encompasses a wide range of injuries from open excavation to falling objects to faulty electrical outlets. Similarly, slip, trip, and fall accidents can happen from property owner negligence as well. Snow or ice and wet spots, loose flooring or carpeting, failure to repair walkways and thoroughfares can all present a hazard that leads to a personal injury case. Finally, liability and damage can be caused by such product defects as faulty vehicle parts, defective goods, recalls and contaminated foods. If you think or decide that you have a personal injury case, then typically it will begin when you, the individual—the plaintiff, files a civil complaint against the other party, the defendant, with the aid of a personal injury lawyer. The defendant may be another person, company, business, corporation, or government agency. Filing the complaint will formalize the process of proceeding with a personal injury lawsuit through a civil court. Should I Go to Trial or Settle My Personal Injury Claim? Another thing to consider if you believe you have a viable personal injury case is that it may be possible to reach an agreement or settlement with the defendant without or before going to court. Lawsuits can be filed from the first day of the accident, but for a good portion of personal injury cases, a lawsuit is a last resort. Seeking a negotiated settlement can also avoid the costs that a lengthy trial can accrue. Your personal injury lawyer can counsel you on the amount of money being offered, and whether or not to pursue a lawsuit. Personal injury cases cover a wide range of accidents. The experience can be trying and debilitating, emotionally and physically. Knowing what a personal injury claim is and knowing if you have a viable personal injury case may leave you second-guessing yourself. If you have received any harm as a result of negligence from another party, you should seek advice from a personal injury attorney.